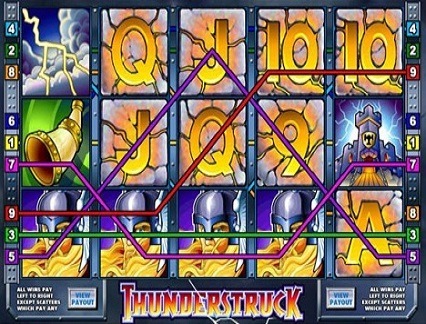 Game Information: Thunderstruck was launched in 2004 by Microgaming and quickly became one of the brands most played video slots of all time. The game is based on the Norse God of Thunder, Thor and his mythical and magical hammer, thought to be the source of lightning and thunder. The game is one of Microgaming’s most straightforward and easy to play and features 5 reels and 9 paylines, along with a host of other special game features including wilds, scatters, free spins and bonus rounds. Read our review of Thunderstruck and see just why this game is still so popular, more than a decade after its launch. Thunderstruck offers a number of great game features and is one of Microgaming’s most copied games, take a look at this simple breakdown of the main game features on offer. Thunderstruck features a wild symbol, represented by the God of Thunder himself. The wild symbol can be used to substitute any other game symbol with the notable exception of the games scatter symbol. The wild symbol can make winning combinations even easier and will also double all wins that it forms a part of. The games scatter symbol is represented by the rams head and getting three or more of these symbols anywhere across the 5 reels will automatically trigger the games free spins round. The free spins round includes a 3x multiplier which can go a long way in adding big totals to your bottom line. Thunderstruck is quite an old game now and some may consider the slightly cartoon/comic book-like graphics to be a bit dated. This is still however a favorite among diehard lovers of Nordic mysticism and the game is full of great symbols including Thor’s legendary hammer, lightning bolts, a stormy castle, Thor’s fist, a horn and many other mystical Nordic symbolism, accompanied by the sound of thunder and lightning. 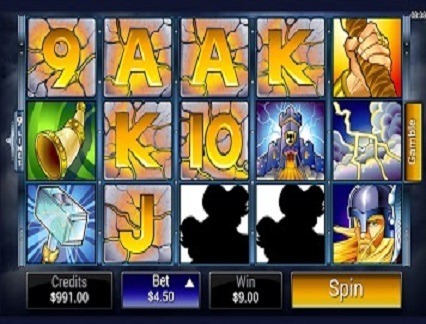 While Thunderstruck is not a progressive jackpot pokie like Microgaming’s Dark Knight or Major Millions, it is still nevertheless considered to be a medium to medium high volatility game. The house edge on this game is roughly 4% and the RTP (return to player) is estimated to be around 96% which is quite good, especially when one considers the age of this game. The maximum possible jackpot in Thunderstruck is 150,000 coins, achievable if played at max bet and maximum coin value with all paylines in action on every spin. The base game maximum possible win is an estimated 10,000 coins and this game offers more than enough flexibility to be a first choice for all budget types. Apart from the games wild symbol which offers easier winning combos with the addition of a 2x multiplier and the scatter which offers free spins with a 3x multiplier, the game is quite simple and straightforward. The only other special feature is Microgaming’s Gamble Feature which allows players to push their luck a bit further after a winning result. The gamble feature allows you the opportunity to either double or even triple your winnings with a simple card-based guessing game. All that you have to do is simply guess the colour of a down-facing card, get it right and you automatically double your money. If you manage to also guess the suit correctly you automatically triple your money. Of course getting it wrong forfeits your entire winnings in one fell swoop!